Moselleh Beach in Mattru Jong. Eco-tourism. This is Moselleh Beach in Mattru Jong. Buried beneath a canopy of well-preserved trees and bushes, the beach is unique with clean and soft sands, stretching toward the raging waterfalls of the Jong River. Maintaining the beach requires a cadre of workers to keep it clean of falling leaves and annual debris deposits from the overflowing river as a result of the rainy season. 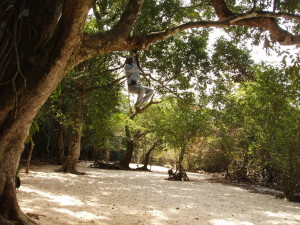 Since 2006, Twenty-First Century African Youth Movement has been working with a team of youth and adult volunteers to create a recreational opportunity for the people of Mattru Jong with the hope of building a thriving Eco-tourism program to create employment for the youths of Bonthe District. According to the World Bank, “eleven million youth are expected to enter Africa’s labor market every year for the next decade.” To ensure peace and security, creating employment for young people should be a policy priority for the Sierra Leone Government. But, it is going to take individual effort at community levels to translate those policies into actionable and achievable program ideas and opportunities to absorb young people into the workforce through foundation training and vocational training as a first approach, especially in the rural communities. 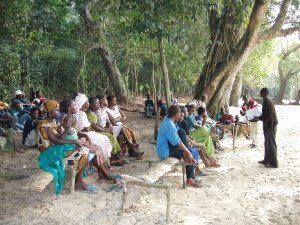 Tourism and Agriculture could provide just the right opportunity needed to address the problem of youth employment and underemployment in rural Sierra Leone. for employment of youth in rural communities. Mobilizing and training the largest number of youths in Jong Chiefdom is a priority designed around six programs (Arts, Technology, Agriculture, Education, Entrepreneurship, and Eco-tourism) that are been rolled out through the AYM Social Enterprise and Business Incubator Center at 41A Momaligie Road, Timbo Section, Mattru Jong. Recently, a younger brother, Duraman Conateh, after a visit to the center made this succinct observation that “mass and sustained sensitisation in the township will increase local revenue.” Every increase in local revenue is an employment for an unemployed youth. We listened and, are there working on a marketing strategy to deliver. But we need partners and, if you have what it takes to translate vision into action, AYM is for you. It’s a Movement, join and define your role – Extinguishing Poverty through Innovative Strategies! AYM is a 501(C)(3) Nonprofit Organization, EIN 39-1742519. Our mission is to Create Jobs and Employment for Youths in Africa!